During the Nazi regime, concentration camps were used for a variety of purposes. Immediately after the Nazis’ rise to power in Germany in 1933, so-called 'early' or 'wild' camps served as central instruments for both the incarceration and torment of the regime’s political opponents. Under the supervision of the Chief of German Police and Reichsfuehrer-SS (Leader of the SS) Heinrich Himmler, the National Socialists standardised concentration camps according to the Dachau model up to 1936. At that time, the SS was responsible for the administration of all camps which was carried out by the Inspektion der Konzentrationslager (IKL, Inspectorate of the Concentration Camps). In March 1936, SS-Wachverband divisions were renamed SS-Totenkopfverband divisions (Death’s Head Divisions) – a name that changed again in 1940 when they were referred to as Waffen-SS. Political Police forces were responsible for transferring prisoners to concentration camps. Between 1936 and 1938, the then prevailing concentration camp system was further developed to meet the requirements of the ever increasing number of groups that were being persecuted and incarcerated. After the introduction of special measures on crime prevention, criminals, 'asocials', Jehova’s witnesses , homosexuals and, following the pogroms of 1938, also 25,000 Jews were transferred to camps. At about the same time, the regime started to draw an ever increasing economic benefit from the incarceration of camp inmates by exploiting their manpower. In order to facilitate the Nazis’ huge construction projects, concentration camps were primarily erected close to quarries, such as Mauthausen in August 1938. The outbreak of World War II entailed a considerable increase in inmate numbers due to waves of arrests both in the occupied countries as well as on Third Reich territory. The introduction of three camp grades resulted in different degrees of harshness and deprivation for the respective inmates with the number of casualties rising dramatically. As the only camp to be labelled a 'grade 3' facility at that time, Mauthausen recorded a surge in its death toll from 24% in 1939 to 76% in 1940. Up to 1942, inmate workforce which had by then become increasingly important was still mainly exploited for SS manufacturing companies. The course of the war after 1941/42 and the systematic slaughtering of European Jews as well as of Roma and Sinti led to yet another change in camp system development. Sites in Western and above all Eastern Europe, including their various outposts at armament factories, sped up the expansion of the camp system which was subordinated to the control of the SS-Wirtschaftsverwaltungshauptamt (WVHA, SS Economic and Administration Office) as of March 1942. While death or extermination camps were erected on Polish territory for the industrialised murder of European Jews, inmates of the other camps were mainly subjected to forced labour, with the majority of them being used to relocate factories to underground production sites in the final stages of the war. It was especially in this field that the SS maintained close and for their purposes utterly successful relations to the private industry. Jewish prisoners were primarily deported to extermination camps, with only those being registered for and subjected to forced labour that had survived selection. From spring 1944, the decommissioning of extermination camps led to a surge of Jewish inmates in the remaining concentration camps. The main pre-requisite for camp clearance was that no inmate was ever to fall into the hands of the enemy - an order which resulted in the death of ten thousands of prisoners on death marches as well as due to the absolutely disastrous conditions in the remaining camps. Surrounding quarries heavily influenced the choice of Mauthausen (Gusen from December 1939) as a site for concentration camp construction which was started in August 1938 by inmates from Dachau and Sachsenhausen. Apart from supporting the SS’ political and ideological aims, the Mauthausen/Gusen camp complex mainly served the extraction of stone from the quarries, the production of arms and plane engines as well as the construction of underground manufacturing facilities for the relocation of the armament industry into bomb-proof shelters (Steyr-Daimler Puch and Messerschmitt). Mauthausen, a 'grade 3' facility, was mostly used for extermination and was as such characterised by the most abominable incarceration conditions. From March 1942, inmates were killed by means of toxic gases in a chamber and a van especially adapted for this purpose . In the course of Operation 14f13, sick inmates were transferred for killing to the gas chambers of the Hartheim euthanasia killing centre as of August 1941. Due to the severe lack of manpower for both the construction and armament industries, more than 40 outposts of the Mauthausen camp were erected close to huge construction sites and armament factories from 1940 onwards. Working conditions in those outposts which were used to relocate armament and missile production to underground facilities were unanimously labelled the harshest. Out of about 200,000 inmates, who were incarcerated in the Mauthausen camp complex (including all sub-camps) between 1938 and the camp’s liberation in May 1945, approximately 100,000 died. The Ebensee concentration camp was erected as a labour camp subordinate to the Mauthausen concentration camp. The first inmates arrived in Ebensee on 18 November 1943. Until the time when the construction of the first barracks was finished, the prisoners had to stay in a storehouse of the weaving mill. To cover up the existence of the camp, SS officers used the code names Kalk (limestone), Kalksteinbergwerk (limestone mine), Solvay and Zement (cement). The main purpose of Ebensee was to provide slave labour for the construction of the enormous underground tunnels which were to be used for research purposes and the development of the A9/A10 Interkontinentalrakete (intercontinental rocket). The original plan had to be given up as other productions of military importance were assigned a higher priority. Those parts of the tunnels, however, that had already been finished were used for fuel production (Tunnel A) and the manufacturing of motor parts for tanks and lorries of the Steyr-Daimler-Puch Werke and the Nibelungen Werke (Tunnel B). The production of fuel from crude oil started within the framework of the Geilenberg programme on 4 February 1945. In all, 7.6 kilometres of underground facilities were built by camp inmates within about 16 months. 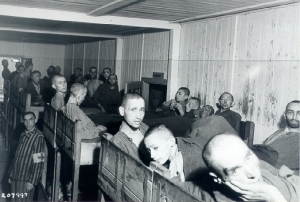 Apart from a few exceptions, all prisoners were registered in the Mauthausen concentration camp and then transported to the subordinate camp in Ebensee. According to the camp registers, 27,278 male prisoners were incarcerated in the Ebensee camp between 18 November 1943 and 6 May 1945. About 1,500 camp inmates were transferred from Ebensee to other subcamps, e.g. to Redl-Zipf (code name Schlier) or Wels and after several months brought back to Ebensee; as a result these prisoners were registered in the camp records a second time. From January 1945 onwards, transports with masses of prisoners arrived from evacuated concentration camps and led to an unbearable situation and the complete breakdown of supply. On 23 April 1945, the number of inmates in the Ebensee camp reached its peak with 18,509 prisoners. Members of the SS command tried to bring about the death of the new arrivals most of whom were of Jewish origin and therefore to minimise the number of camp inmates. The camp inmates belonged to more than 20 different national groups. Prisoners from Poland, Russia, Hungary, France, Germany, Italy, Yugoslavia, Greece and Czechoslovakia constituted the largest national groups in the Ebensee concentration camp. The Jewish prisoners who had been deported to Ebensee from a number of different countries accounted for some 30 percent of the inmates. The living and working conditions of the camp inmates were dominated by their ethnic origin and the categorisation according to the criteria of Nazi race ideology. Soviet and Polish workers were treated worse than others, Roma, Sinti and Jews ranked lowest in the strict racial hierarchy. Moreover, in many cases the Jewish camp inmates reached Ebensee completely exhausted after several days of walking or travelling in open cattle cars and therefore had only a small chance of survival. 2,059 Jewish prisoners arrived in Ebensee with one of the most notorious transports from Wolfsberg, a subcamp of Groß-Rosen, on 3 March 1945. 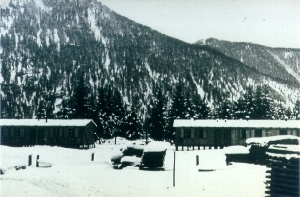 On the order of the camp commander Anton Ganz, they had to stay outside the protective barracks in snowfall and cold weather for nearly two days. 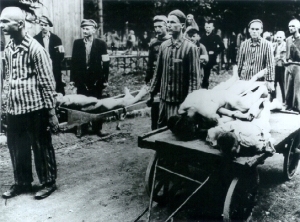 Hundreds of prisoners died of the consequences of the transport or these gruesome first days in the camp. With one of the last transports, members of the Fälscherkommando (counterfeit unit) of the counterfeit operation Aktion Bernhard were transferred from the subcamp in Redl-Zipf ( code name Schlier) to Ebensee. On 6 May 1945, the 3rd Cavalry Reconnaissance Squadron of the US army liberated the Ebensee concentration camp. Despite medical aid provided by field hospitals and supply by the UNRRA (United Nations Relief and Rehabilitation Administration), about 750 camp inmates died in the wake of the camp's liberation. From July 1945 to Januay 1946, the US army used the former concentration camp to incarcerate German SS members of the Panzerdivision Hohenstauffen, later on, it served as a DP (displaced persons) camp. Building works for the erection of apartment buildings which still exist on the former camp site started in 1949.